Two beautiful South African ladies have been spotted in the same dress and we need a ruling. Yip, it’s another case of b***h stole my look. The dress is a work of art; a beautiful black velvet dress with a dramatic one-sleeve ombre black and white draping in an African print pattern. The creator of this masterpiece is the incredible Biji of Biji La Maison de Couture in Johannesburg who is also responsible for Bonang Matheba’s jaw-dropping 31st birthday dinner gown. The dress was first seen on Miss World SA, Thulisa Key. Biji custom-made the dress for Thulisa to use as her national costume when she represented SA the 68th annual Miss World pageant in China in December 2018. She wore the dress with a simple pushed-back hair-do and simple drop earrings. 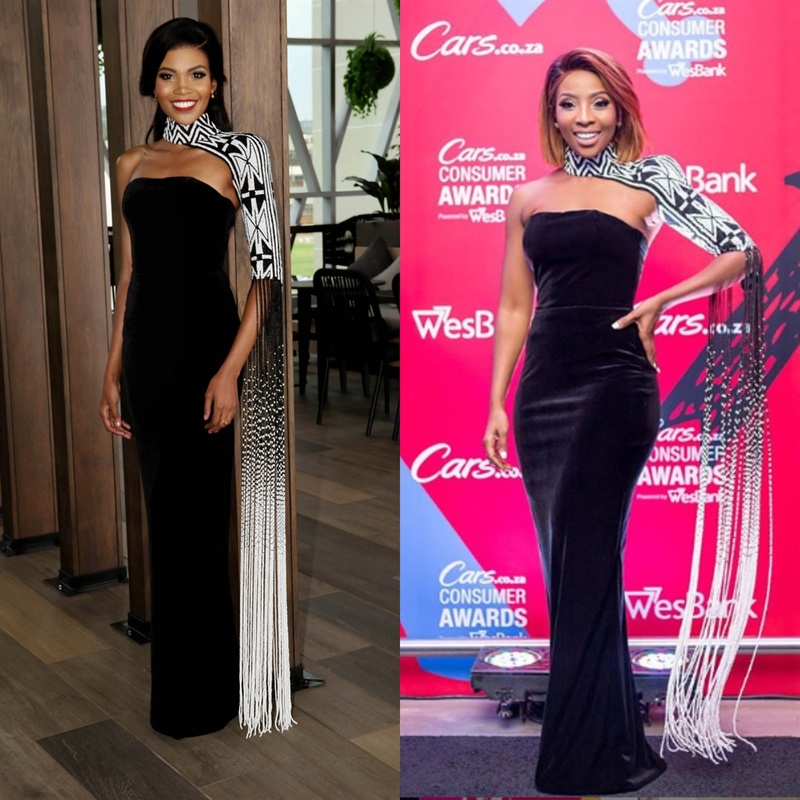 Meanwhile, Pearl Modiadie wore the same dress last night at the 4th annual Car Awards in Johannesburg. She too kept it simple and chic in a short brown bob hairdo and simple white pearls were her earrings of choice. THULISA KEYI AN EARLY FAVOURITE IN THE MISS WORLD PAGEANT! Now, who wore it best?